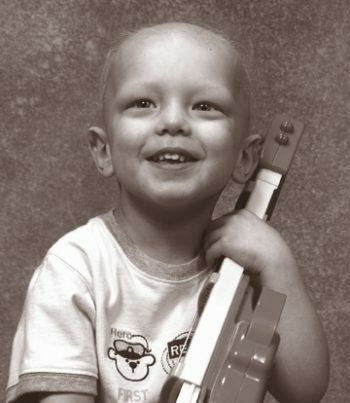 Our precious son, Zachary Voss, was diagnosed with a brain tumor on March 27, 2006, just two weeks after his second birthday. His symptoms were vomiting and loss of balance (ataxia). An MRI revealed that Zachary had a medulloblastoma, an extremely aggressive form of brain cancer that was completely coating his entire brain, partially coating his spine, and tumor cells were floating in his spinal fluid. Immediate chemotherapy was needed to save his life. Zachary received three rounds of conventional chemotherapy followed by three rounds of high-dose chemotherapy. He received stem cell transplants following each round of high-dose chemo to replace his bone marrow. Zachary was cancer-free for 2 months, but a spinal tap in September 2006 revealed that the cancer had returned. At that point, we had some terrible choices to make. Ultimately, we placed Zachary wholly in the Lord’s hands and prayed for a miracle. Zachary went to heaven on December 1, 2006 and we miss him terribly. We pray no other family has to go through what he went through and that a cure will be found someday. Zachary was a precious little boy who absolutely LOVED to read! He also loved animals, Blue’s Clues, blowing bubbles, music, coloring, watching Family Feud, doing puzzles, singing, and his cherished stuffed monkey. He named his favorite blanket “One” and liked for it to be folded in a rectangle. He loved people, especially other kids, and was such a good patient. He loved Dr. Foreman and all our other wonderful medical staff at Children’s Hospital Colorado. We are so thankful for his team of doctors and nurses who took such good care of Zachary.